The lovebirds are birds that belong to the family of the parrots, the same as the parrots and parakeets. They are popularly known as "inseparable", because they develop very strong affective bonds with their partner, who remain faithful all their lives once they have chosen. They come from Africa, so they need a warm climate to be able to live and be healthy. 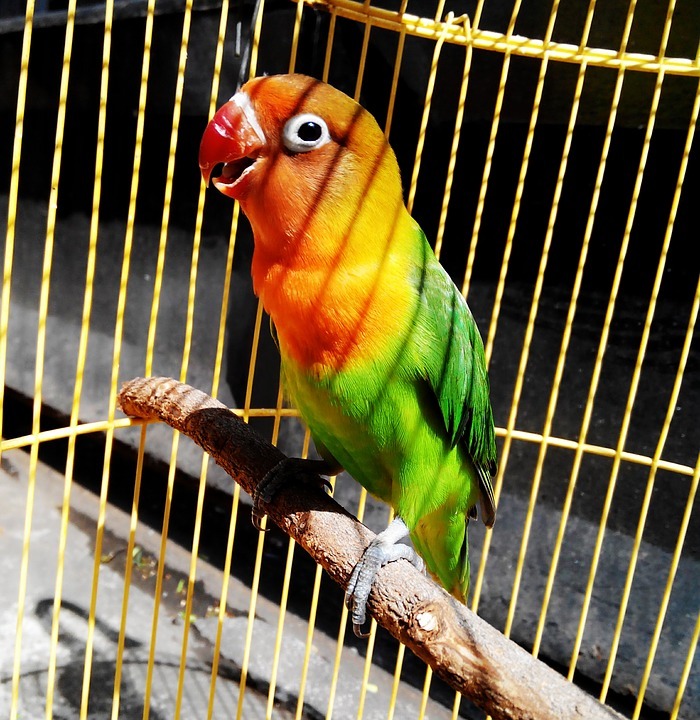 Due to its beautiful vivid color, radiant and small dimensions, many people adopt them as a mascot, but the truth is that it is not a bird reserved exclusively to the domestic field, but they present certain peculiarities that must be taken into account so that Be well cared for and grow healthy. If so, our lovebirds can last no less than 20 years. Let's see which ones you should give every day. Even if they are in a cage, lovebirds are birds that fly regularly in nature, so they need a little freedom to stay healthy and fit. Of course, remember that they should not be exposed to any possible danger, so it is important to remove any type of plant that may be poisonous to them and objects that may endanger their safety. The ideal is to open the cage once a day, always with the house windows closed so they can not go out and get lost. This way, you can stretch your legs, flutter and browse. If you have time, play a little with him and give him prizes. Also, you should know that the music loves and encourages them, making them want to sing. Lovebirds are very social and affective animals, so they need to establish bonds with other equals of their species. In the event that a member of the couple dies, it is important to replace it as soon as possible. We can also create a more numerous group, but always trying to make them couples. Don't worry if you don't want to have many, as they only breed if they are provided with a nest box. Light is a fundamental element for birds. This light must be direct without passing through a glass that filters the UV rays. So the ideal thing is to place them near a window and open it frequently. During the winter, use a light bulb so they don't go cold with the window open. Like any other bird, lovebirds need water to live, so you must provide daily and check that it always has, especially, in summer. Also remember to change it every day so that it does not pond and begin to proliferate bacteria. In the market it is possible to find a great variety of products for lovebirds, but the truth is that there are some better than others. We always recommend a mixture of varied grains with low fat and supplemented with minerals and vitamins. This seed mixture should bring about 50% of the whole diet. But you can also add a daily tablespoon of fodder for lovebirds of good quality, since this is a very comfortable and balanced option. In addition, occasionally you must give him traces of fruit and vegetables. This type of plants, in addition to providing them with nutrients, keep them entertained. In any case, it is important that you always do so in moderation. Although they are birds, lovebirds also need a little affection to get along with their caregiver. If you offer them affection, tranquility and comfort, and speak to them with affection, you will have no problem. Lovebirds are very intelligent birds and require constant stimuli, so they have a very bad time when they are bored. Many cages already bring with them hanging toys and stairs, but if not, you can afford to entertain. You can also put some twigs to hold, jump from one to the other and wear the nails and beak.